Buy the Arno Kit and start learning Arduino. Now choose between a hard copy book or learn Arduino with our interactive website! 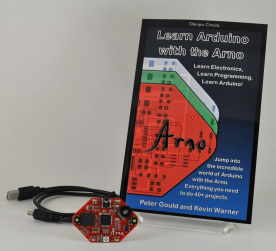 Check out the Arno Page for more information about the Arno board and book kit. Olympia Circuits has grown from a collaboration between makers in Olympia, Washington. Our goal is turn our ideas into real products that can fuel the creavitiy of other makers. We're combining our knowledge of hardware, software, and engineering to design and build cool things. The lead makers that created Olympia Circuits are Peter Gould and Kevin Warner. Having diverse backgrounds in engineering and science, they have worked together on a wide range of microcontroller projects both for fun and for commercial use. We design and build our products right here in Olympia.